It is difficult to convey the exotic colors and the interactive response of images to the live characters on the stage, but they are often wonderful. This image captures Wotan and Loge walking down to take the gold from the Nibelungen. The Rhine Maidens, in what looks like a performance at the American Ballet, splash and sing as the water rises. To solve the question of how the world began, we have only to look to Richard Wagner. No big bang here. Quite the contrary, the world begins with music, a very feint E flat. Shortly a B flat hovers over the E. Then an E flat major chord is arpeggiated, followed by the first sung utterances: Woia,Waya, Woge. These sounds, not words, are reported to be the last Wagner breathed before he died. They mean nothing. No one has ever thought the Ring was meaningless, however. It is nothing less than the sound and the fury signifying everything. 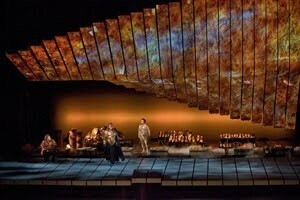 What surprises about Rheingold as you listen, and in this production the voices across the board are glorious, is how simple and simply gorgeous the music is – from the pit and in the voice. It is not burdened by heavy thoughts, but liberated by them. Note that I have not started with the much-discussed production. I suspect its problems can be corrected and hope they will be, because many effects give great pleasure to the eye. I enjoyed a march to the land of the Nibelungen taken by gods Wotan and Loge; the beautiful scene in which the Rhinemaidens first appear, dangling under water, swishing their mermaid tails; the forging of gold in the earth below is portrayed with high drama mid opera. If the rainbow bridge, which failed due to computer glitches on opening night, was in fact fully operational on Monday, it disappoints. I know what rainbows look like and this was no rainbow, nor did it suggest one. The two prows which carried the giants were grand, the twisting planks on what the designer and members of the Met crew and cast have come to call ‘The Machine’ were often dazzling. But in the end, the conception is strewn with unfortunate body doubles skimming down the planks tilted to 45 degrees and then emerging as their real selves from the depths. Doesn’t work. How this will be captured in the broadcast on Saturday’s HD broadcast, we don’t yet know. Watching a video projection on opening night, I was disappointed in the beiginning images. But in the house they are wonderful, suggesting primordial ooze, which Wagner would have liked I’m sure. Perhaps the gifted crew that brings us the HDs will capture this. They are often able to overcome awkardness apparent in the house. Yet, with the magnificent performances of Eric Owens, today’s go-to bass, Stephanie Blythe, Robert and Dwayne Croft and Bryn Terfel, who is somewhat challenged in the bass register, this should prove a rich afternoon at the opera. James Levine’s seamless mesh with music is at its acme. Wagner must have felt music as an integral part of himself. So too will anyone who is lucky enough to get a ticket for the HD broadcast on Saturday, October 9.